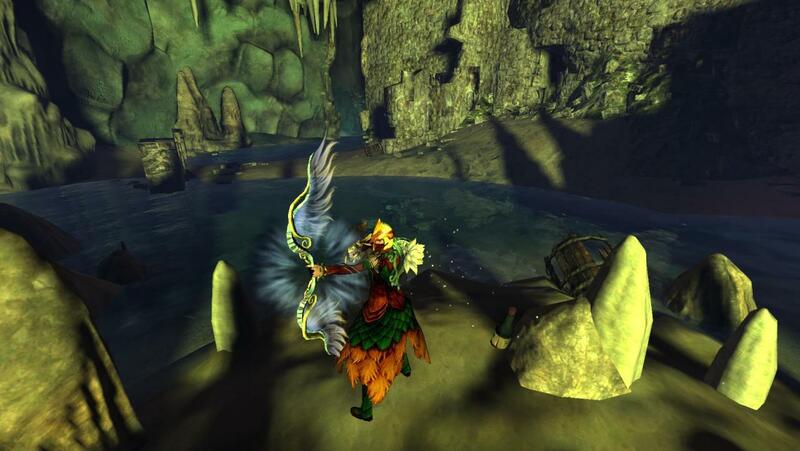 So I finally got the owl griffin mount last night. Yep, after the money made from Halloween, I went ahead and splurged the 250 gold. In packets of 50g per map. It was like paying mortgage. I'll need to level it up now. I already have the mastery points saved up. So it's just a matter of doing XP. I'll probably just do map completion that I need to do on all my characters anyway for their class spec collection. That should be more than enough. So I've completed the personal story and all 4 of the free mounts mastery tracks. Also did a bit of dabbling with weaver and did the starting personal story on 2 more characters to check out a few things. Also, staked reddit for news and stuff. So I'm ready to do my initial review. I think in a lot of respects, PoF is the culmination of a lot of learning and feedback taken from the players in response to HoT. It attempts to capitalize on the things people liked, correct what they didn't like, and sometimes go overboard in the attempt. There's probably more stuff that I can't remember right now. Ask me and I shall trying to give my thoughts on it. Ok, first off I'm going to admit that I didn't really spend that much time playing the demo this weekend. In my defense, I was kidnapped by my long-departed mused and held hostage over at google docs. (I have a 2nd chapter of my TBG omake series written and parts 3 & 4 vaguely plotted.) So, since inspiration is harder to come by and I've already prepurchased the game, well, that sorta set my priorities. Anyway, the upcoming weekend will have the specializations demo. Currently, it seems the demo characters will only have access to WvW and PvP for testing. Players are also arguing for aerodome (raid testing) access. Also not sure how it's going to work with existing WvW queues and maps... Best case is they'll make a new WvW instance for the demo to avoid conflicting with actual WvW games. Either that or just restricted to Edge of the Mists, I guess. So, the big news is that the next expansion, Path of Fire, will be coming out in late September. It's going to take place in Crystal Desert/Elona, and the big bad looks to be Balthazar, though Palawa Joko and/or Kralkatorik may or may not (probably not) also bite the dust. * Gliding is being added to WvW tomorrow. Since gliding only comes with HoT and PoF can be bought separately, I'm guessing it's just enticing new players to buy both. * Consumables are getting revamped to use Concentration/Expertise instead of condi/boon duration % value. Results in a nerf on those stats, which is a hit to meta HoT-based builds. Doesn't really impact me, since even my vipers engi doesn't use condi duration food often. * Human Elona-based faces and hairstyles are already available in character creator (and makeover kit). * There will be an open demo starting this Friday, available to everyone. If it's anything like the HoT beta, it might be a good idea to move all legendary/ascended gear into the bank beforehand so the demo character can use them. First of all, disclaimer: I'm really casual where it comes to STO, playing only a single character and not having paid much attention to the meta discussions on reddit, so I can't claim to be all that authoritative on it. With GW2 I think I can speak better toward it, since I've played all classes pretty far and I've read a lot on the high tiers of play (raids/high fractals) so I am familiar with what goes on there. In the end I wound up spending about 100g total on making this. The majority of the cost came from the T6 leather for making the Gift of Light. Ugh. Damn you lopsided T6 mat prices. The charged lodestones I had from a combination of saving up over time, raiding cashew's mats, and promoting from cores (so much clicking T_T). Gotta say, though, I like this skin better than the Kudzu one. Loads cheaper than a legendary too. =P It's just a pity I don't have many characters that actually play the longbow. I actually had the resources to finish making Flameseeker Prophecies earlier, but I procrastinated a lot. Finally got it finished though. Also managed to use up a few stacks of T5 mats in the guild bank. The pretty pretty shield is going on my revenant, as is lore appropriate. Also finished the specialization collection for Yggdrasil, the ascended staff for my ranger druid; though I'm actually using the Auric skin for it. Since the collection for Bo, the daredevil staff, is only a few items different from Yggdrasil, that's next on the list. So it's been over a month since the Heart of Thorns expansion came out, and I figured I should write something up on my impressions. I had wanted to wait until I played more of the content, but looking over my progress that's probably going to take a good while, which may not necessarily be a bad thing. The Bandit Weapons Specialist collection gives you a 20 slot bag at completion. Uses the icon of the bandit loot bag, so I spent like a minute clicking it like a fool before realizing what it was. Anyway, you trigger the collection with a book bought from the SW vendor for 150 bandit crests and 10s. The items in the collection you can buy for cheap from the karma weapons vendor in WvW. The price scales with level, so a newbie char could buy everything for like less than 10k karma. For my own notes... (meta?) solo Condi engineer build. Alternatives - Runes: 4x altruism + 2x privateer, Armor: Rampager (off TP) instead of Sinister. Got inspired by cashew's trials in starting a new elementalist... or maybe nostalgic is more like it. I went back and re-watched my old ele Personal Story recordings. Man, was I embarrassed by my skill back then. Of course, that was also within 2 weeks of the initial launch of the game. So I would certainly hope I'd gotten more skilled at playing the game in general, and ele (my main) in specific, since then. Still, assumptions aren't proof, so I finally decided to roll a new ele to check out the experience the second time around. Also, to experience the New Player Experience changes to the game, since all of my characters were created before that update. I had started a sylvari ele, more to experience the NPE and to fiddle around with character creation settings (in eventual preparation of my sylvari revenant). Then today I managed to start a human elementalist with the same Personal Story options as my main, and get her to level 21 within a single day. Overall, levelling under the NPE feels pretty painless. Yes, utility skills and class mechanics are gated, but those in particular are unlocked pretty fast. Elite skills are still unlocked at lvl 30 like the old system anyway. Traits are a bit more strictly unlocked, so the mid levels might be where things get tougher... I dunno we'll have to see. As for the human ele no. 2's personal story, I pretty much breezed through it. I remember dying over and over again in the 3rd ep of arc 1 (noble arc). Ditto the last ep of arc 2 (circus arc). Here, ep 1.3 was completed without a hitch. And 2.4 was over in like a minute. The difference? We'll it's not the build certainly. The original character had access to more skills during 1.3 than my new ele (which didn't have earth attunement and only had 1 utility at lvl ~10). But the main difference I guess is that the first time around, I was just randomly mashing buttons. Whereas now I'm familiar enough with ele skills to know what utility to go for and what rotation of skills to synergize. Gear might have also played a role, I think. In the original run I didn't have much money, didn't use the TP, and only got my gear through drops and karma vendors, and much of it with vit/toughness speced. In the new run I pretty much buy a new set of blue or green gear every 5 levels, and it's pretty much power power power only. That probably makes a significant difference, what with PvE being very much a zerker's game. For now I've parked both characters at the end of the Sharkmaw JP to see what results I get in terms of silver doubloons out of the chest. Eventually after they hit level 35 (cap for doubloons) or after I lose patience, I'll probably delete the human and continue a bit further with the sylvari to see how the mid-levels plays out. Full Sup Centaur rune set + warhorn trait will still let you maintain perma swiftness from just the horn. My ele is doing really well. Just tweaking a bit with her existing gear, and she's good in HP/armor. Damage stats are doing great too, especially compared to everyone else so far. Also, most of the traits I wanted were in two lines, and the third choice was still pretty obvious above the fourth choice trait line. Ranger is...okay, I guess. I've been sorta able to get the build I want. The buffs to ranger pet and pet skills I really liked, since I like pets. According to the forums, bleeding is underwhelming on ranger, so not considering going condition. Statwise... I can stand to ditch some toughness, actually, and gain some power. Hm... maybe exchange the knights chest/legs pieces for...berserker? Mesmer is in much the same boat as ranger. Trait picks are ok. Stats are a bit low in power; I should probably swap out the cavalier rings for something berserkerish. Guardian... ugh, I gave up on making a build for now. I hear from the forums that a fire-focused condi build is like way waaaaay OP right now, but that's likely the first thing to get nerfed, so I don't want to invest in condi gear/build just yet. Still, I am going to have to overhaul some of her gear - existing stats are high in toughness and way too low in HP, and somewhat low on power. Until I know what the guardian meta is going to end up though, I don't know yet if I want to swap to celestial or carrion or something else. Engineer... surprisingly I was able to decide on a trait build. Already have celestial outfit so can take advantage of the currently OP state of conditions. Could still stand to trade out some toughness for power though. Hm.. maybe swap out rabid accessories for sinister? Well, will see if anything gets nerfed before I throw the time and charged quartz into crafting sinister jewelry. Necro - I heard on the forums that the corruption skills were horribad, but blood stuff is supposed to be good and I think I got a good trait build working. Stats-wise, the only thing I could maybe change is to swap out the soldiers rings for...I dunno, cavalier? Thief... have an ok build for now for utility purposes. Stat wise it's in as bad a position as guardian, with way too little HP and not enough power. Will need to figure something out there, ugh. Warrior... well she's still in rare gear set, so not gonna worry about that one yet.